1: "Before the ages" – before the beginning of time in eternity past (1 Corinthians 2:7). 2: "Past ages" – the periods of time before Christ’s First Coming (Ephesians 3:5; Colossians 1:26). 3: "This age" – the current time period in which we are living, between the two comings of Christ (Galatians 1:4; Ephesians 1:21). 4: "Ages to come" – the remaining time periods since the First Coming of Christ (Ephesians 2:7). This would include the "millennium" and "eternity." What is the prophetic future of the Church…? In order to deal with this we must first understand that the church relates in two ways to the program of God. First, the true church is made up of Jews and Gentiles who genuinely know Yeshua – Jesus as their Messiah and Saviour. Beginning the day of Pentecost in Acts 2 and continuing to the rapture, all believers are part of Christ’s body, the church. Second, there is the realm of professing churches influence which we call Christendom which is associated with the visible church and we see this in all the denominations including orthodox, Catholics and even cults (Mormons, Jehovah Witness etc) that profess that they are Christians. The wheat and tares growing up together (Matthew 13:24-30) and each of these two aspects of the church have very different prophetic destinies. The next event on the prophetic calendar for the true church is the "rapture" (John 14:1-3; 1 Corinthians 15:51-52; 1 Thessalonians 4:13-18). This event is described in 1 Thessalonians 4:17, which says that it will be a time in which the living and dead believers "shall be caught up" in the clouds to meet the Lord in the air. This event could happen at any moment without warning and fits the motif of Christ as groom and the church as the bride. In the present "age" the church is betrothed to Yeshua (Jesus) …totally committed having been bought by His blood. The groom has gone away to the Father’s house to prepare a place to which to He can bring His bride – the true church. While He is away (the current church age), the brides faithfulness is tested by the separation. She is to remain faithful while constantly watching for His un-announced return. When the Father gives the signal, the shout will go forth and the church age will be completed (times of the Gentiles fulfilled) at the rapture …when all true believers will always be with the Lord! However, the rest of the "Christendom" will be left behind to enter into the "tribulation period" as Satan’s harlot – "the great harlot ("apostasy church" or the "tares") who sits on many waters" (Revelation 17:1) …who will help facilitate the great delusion of the Antichrist in the form of a one world church or religion. This apostate church will pave the way for the one-world-religion …the "worship of the Antichrist" …and receive of the "mark of the beast" (Revelation 13:16-18). It is also significant to observe here the presentation of the "False Prophet" (head of the one-world church during the tribulation) as one who is advocating, on behalf of the Antichrist that they receive the number 666. Just as the true church has its role of declaring and making clear the truth of God …so Satan’s harlot has a leading role in fostering great deception. 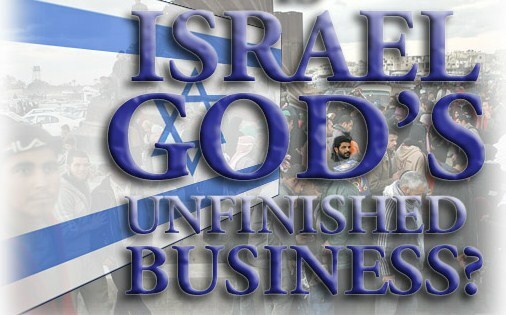 The church is unique in the plan of God and separate from His plan for Israel… The church has not replaced Israel! The church partakes of the "spiritual" promises of the Abrahamic Covenant as fulfilled in Yeshua – Jesus. Israel, not the church – will fulfill its national destiny as a separate entity, during the millennium (after the rapture and tribulation). The New Testament teaches that the church was an un-revealed mystery in the Old Testament (Romans 16:25-26; Ephesians 3:2-10; Colossians 1:25-27), which is why it began "suddenly" without warning (Acts 2) … and why this age will end "suddenly and mysteriously" at the rapture. The church has no non-resurrected, earthly destiny beyond the rapture. The New Testament teaches that the church will be removed at the rapture before the time of the tribulation begins (1 Thessalonians 1:10; 5:9; Revelation 3:10) and taken to the Father’s house (John 14:1-3). The church will be in heaven during the tribulation as represented by the 24 elders (Revelation 4:4, 9-11: 7:13-14; 19:4), and during the seven years it will undergo the "bema" judgment. Bema is a Greek word that distinguishes the reward event for believers from the final judgement of unbelievers, known as the "Great White Throne Judgement" (Revelation 20:11-15). In the Roman times there was a raised platform in the city square or at the coliseums where dignitaries would sit to hear civil matters or hand out rewards, usually a wreath, for competitive accomplishments. These were called "Bema." Paul wrote to the Corinthian believers, "For we must all appear before the judgement seat (bema) of Christ, that each one may be recompensed for his deeds in the body, according to what he has done, whether good or bad," 2 Corinthians 5:10. In Romans, Paul also notes that "we shall all stand before the judgement seat (bema) of God," Romans 14:10. And, 1 Corinthian 3:11-16; 4-1-5; 9:24-27 provide extensive discussion on the basis by which believers will be evaluated at the "bema." At the "rapture," the church will be removed from the earth and be present with Christ our Lord (John 14:1-3) throughout the tribulation (Revelation 19:1-10). 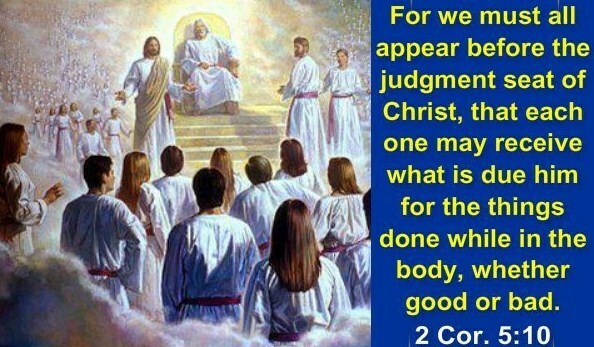 The bema judgement will take place in heaven while the tribulation is taking place on earth, so the church may be adorned as Christ’s bride in order to "descend" with Him at the Second Coming. That the bema evaluation of the entire church takes place after the rapture …but, before the Second Coming is seen in the fact that; "His bride has made herself ready. And it was given to her to clothe herself in fine linen bright and clean, for the linen is the righteous acts of the saints," Revelation 19:1-8. Since the conclusion of the judgement is pictured as clothing of fine linen, the entire church must have gone through her evaluation or bema judgement by the time of the Second Coming. The bride has made herself ready for the "Marriage Supper of the Lamb!" This takes place at the beginning of the millennium after the Second Coming of Christ. While the next event for the true church …the body of Christ is translation from earth to heaven at the rapture, those unbelievers left in the organized church as an institution will pass into the tribulation and form the base of an apostate one-world-religion super church that the False Prophet will use to aid the worldwide rule of the Antichrist (Revelation 13; 17:1-18). The role of the church during the millennium at which time all members of the church will receive their resurrection bodies at the rapture, is to reign and rule with Christ (Revelation 3:21). In Matthew 19:28 Yeshua (Jesus) told His disciples, who are members of the church, that they would join Him in the kingdom and reign over the 12 tribes of Israel. Also, in 2 Timothy 2:12 Paul writes; "If we endure, we shall also reign with Him!" The primary purpose of the millennium is the restoration of Israel and Christ’s rule over it …but, the church (as the body of Christ) is NOT absent from the millennium activities. Scripture is not clear as to whether Israel, the church, and other believer groups will maintain their distinctions throughout eternity. The next major passage providing an overview of the course of “this age” is found in the presentation of the seven churches of Revelation 2 and 3. The perspective of these two chapters is in reference to the program of the church NOT the kingdom. It begins at Pentecost to the rapture as indicated by the often repeated phrase, “he who has an ear, let him hear what the Spirit is saying to the churches” (Revelation 2:7, 11, 17, 29; 3:6, 13, 22). These seven historical churches of the first century provide a pattern for the types of churches that will exist throughout church history. We should be aware that things are looking more and more like the Great Tribulation can start real soon… such as the “birth pains” (pangs) of the earth that are taking place right now with record heat, record cold, droughts, floods, comets, blood moons, solar eclipses, asteroids, record tornado destruction, Star of Bethlehem returning twice after 2,000 years! All this fits together with what we expect to happen during the Great Tribulation. 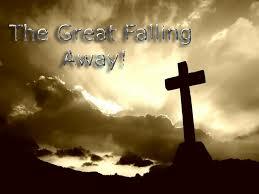 Children of God get ready - the rapture could very well fit in God’s plan for Israel in this generation and soon! The crises that the world is now facing is no accident… consider the fact that we are the only generation in history to see a returned Israel in 1948 and we have also witnessed the recapturing and possession of Jerusalem by the new Israeli nation in 1967 …and in just the last few years, we are witnessing a coalition of nations (almost all of them Muslim) forming around the Islamic (anti-Jewish and anti-Christian) upheaval in the Middle East and is evidence that we are living in very prophetic times! The border crisis between Israel and Syria coupled with the addition of 24 hour surveillance of cameras at the Temple Mount (Mount Moriah) shows that the Middle East is literally on a “knives” edge. Zechariah 12:2 tells us the world would be drunk with Jerusalem, and they are! The proposed 24 hour surveillance would be much needed when the 2 witnesses of Revelation 11:3 appear before the world. The 24 hour surveillance camera would make it very easy for God to use man’s devices to spread His Word. The hatred the world has for the message of Yeshua (Jesus) will be very evident when these two preach. In the midst of prophecies about dark times, our Lord offers us some beautiful words of comfort and speaking about the close of the age in… Luke 21:25-28; “And there shall be signs in the sun, and in the moon, and in the stars. And on the earth will be anxiety of nations with perplexity; the sea and the waves roaring; men fainting from fear, and expecting those things which have come on the earth. For the powers of the heavens shall be shaken. And then they shall see the Son of Man coming in a cloud with power and great glory. And when these things begin to happen, then look up and lift up your heads, for your redemption draws near!” The Lord warned us that the whole world is going to be shaken. How are we going to react to all the promises to turmoil and conflict…? Do we get depressed and discouraged…? Or do we say, “Praise God our redemption is very near…? Our reaction will tell where our hearts are! 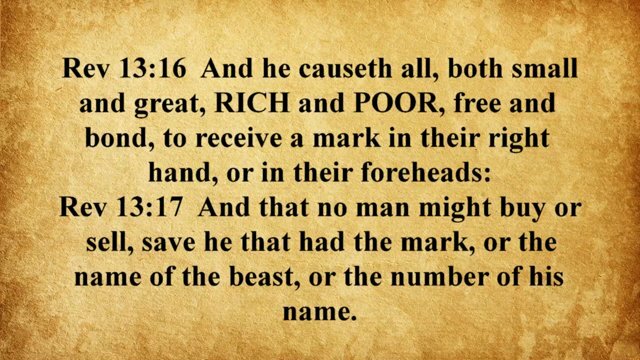 So what is the Mark of the Beast…? The Mark of the beast is mentioned in Revelation 13:16-17; 14:9 and 20:4. According to the first of these passages, during the tribulation everyone will be required to receive the mark or the name of the beast before “buying or selling,” that is, before they can conduct any normal daily business. Those who do not have the mark will be subject to great difficulty and persecution. To take the mark will signify one’s belief that Satan is the supreme deity. The mark will be a visible symbol of the immense power and worldwide authority of the Antichrist. Thousands of people will refuse to receive the mark and according to Revelation 20:2-4, they will be beheaded! Aren’t we already seeing much of this today through ISIS and radical Islamists…? We believe this is just the beginning and sign of things to come. 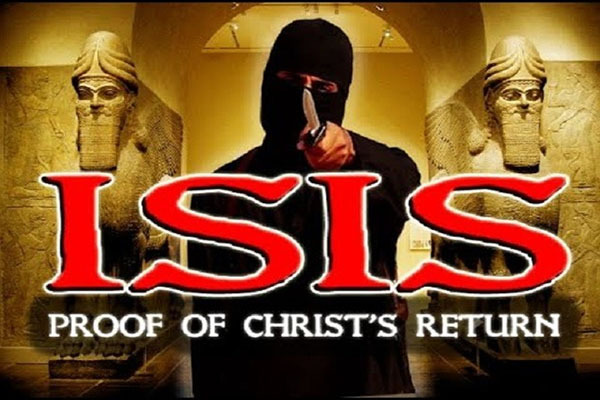 However, believers in Yeshua who refuse this “mark” and are beheaded will be resurrected at the Second Coming of Christ! Clearly with today’s technology, this future world ruler who is in complete control would have the ability to know which people had pledged their alliance to him and received the mark and which people had not received it. 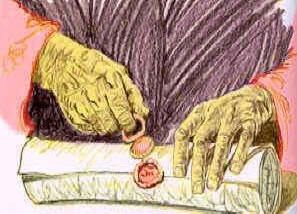 The Biblical word for “mark” is similar to our modern “tattoo” or “brand.” Throughout the Bible, the word for “mark” is used to distinguish or indicate something by a “sign.” For example, it is used many times in Leviticus as a reference to a mark which renders the subject ceremonially unclean, usually leprosy. In Ezekiel 9:4 there is a use of “mark” similar to the way it is used in Revelation. Here the mark of preservation similar to the way the blood on the doorposts spared the Israelites from the death angel (Exodus 12:21-30). In Ezekiel the mark is placed on the forehead, which anticipates Revelation’s use of the term. The mark must have been some sort of branding similar to that given soldiers, slaves, and temple devotees in John’s day. In Asia Minor, devotees of pagan religions delighted in the display of such a tattoo as an emblem of ownership by a certain god. “Charagma” (mark) was a term for the images or names of emperors on Roman coins, so it fittingly could apply to the “beast’s” (Antichrist) emblem put on people! The Antichrist’s mark appears to be a parody of the plan of God, especially God’s “sealing” of the 144,000 witnesses of Revelation 7. God’s seal of His witnesses most likely is invisible and for the purpose of protection from the Antichrist. The Greek word “seal” is totally different term than the word “mark.” On the other hand, Antichrist offers protection from the wrath of God … a promise he cannot deliver on and the mark is external. Since those taking the mark of the beast take it willingly, it must be a point of pride to have, in essence, Satan as one’s owner. The term “mark” denotes “loyalty, ownership, and protection, just as the seal given the slaves of God. The verb (charasso – “I engrave) is the source of “charagma (Acts 17:29). It will be visible and the point of recognition for all in subjection to the Antichrist. The Bible speaks precisely what the mark will be: 1. The Antichrist’s mark, identified with his person. 2. The actual number 666, not representation. 3. A mark, like a tattoo visible to the naked eye on the person, not in him or her. It will be recognized not questioned. 4. It will be voluntary, not involuntary – not even through trickery. 5. It will be used after the rapture not before and in the second half of the tribulation. 6. It will be needed to buy or sell and universally received by non-Christians but rejected by true Christians. 7. It will be a show of worship and alliance to the Antichrist promoted by his false prophet. 8. The mark that will lead to eternal punishment in the lake of fire. The real mark of the beast must be received as a result of us going against God and His law. Satan is going to deceive the world into accepting a law of “one world government – one world religion beast,” which will go against the law of our Creator God. Take a look at what the result of receiving this mark will be… “And the third angel followed them, saying with a loud voice, If any man worship the beast and his image, and receive his mark in his forehead, or in his hand, the same shall drink of the wine of the wrath of God, which is poured out without mixture into the cup of his indignation; and he shall be tormented with fire and brimstone in the presence of the holy angels, and in the presence of the Lamb,” Revelation 14:9-10. Did you see what it said…? The angel represents Gods messengers on earth, and they are saying that the “mark of the beast” is to do with WORSHIP! 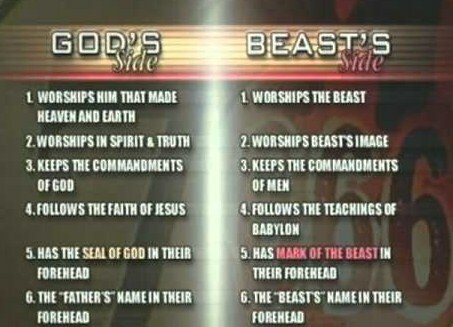 Anyone who “worships” the beast” by accepting its laws and traditions over the law of God will receive its mark. In this Scripture the word “in” is the Greek word “epi” meaning: on or upon. (strongs concordance 1909). Therefore those who receive the beasts mark will be those who follow the beast …or its image instead of God and, they will be thrown into the lake of fire! The world has a choice to make in the last days, and the choice is to either obey God …or obey Satan and his beast! It is important to remember ...even specific prophecy that is fulfilled during the church age relates to God’s prophetic plan for Israel and not directly to the church. For example, the prophesied destruction of the Jerusalem and her temple in 70AD relates to Israel (Matthew 23:38; Luke 19:43-44; 21:20-24). It is not inconsistent that prophetic preparations relating to Israel are already underway with the fulfilment of prophecy of the re-establishment of Israel as a nation in 1948, even though we are living in the church age. The church must recognize that God is not finish with Israel and that we as Christians must support Israel and God’s plan for His people and nation. The study of Bible prophecy is divided into three major areas: Israel (the Jews), the nations (Gentiles) and the church. Much detail is given prophetically concerning God’s future plans for Israel. When we as the church take these prophecies to Israel literally, we see a great prophetic plan that lies ahead for Israel as a people and nation. When the church spiritualizes these promises, as it has done too often in history, Israel’s prophetic uniqueness is taken unrealistically into the church and is replacement theology. God has an amazing and blessed future for individual Jews and national Israel… God’s promises to Abraham and Israel are unconditional and guaranteed through the various covenants! A definite pattern for Israel’s future history was prophesied in Deuteronomy 4; 28-31 even before the Jews set one foot into the land. The predicted pattern for God’s plan for Israel was to be as follows: They would enter the land under Joshua; they would eventually turn away from the Lord; they would be expelled from the land and scattered among the nations. From there, the Lord would re-gather them during the “latter days” (days we are living in) and those who have not accepted Yeshua (Jesus) as Messiah would pass through the tribulation. Towards the end of tribulation those Jews would be regenerated and recognize their Messiah, Yeshua. Christ them returns to the earth to rescue Israel from the nations who have gathered at Armageddon to exterminate the Jews. A second re-gathering of the nation of Israel occurs in preparation for their millennium reign with Yeshua, Christ Jesus – during which time ALL of Israel’s unfulfilled promises will be realized. This pattern is developed by the prophet’s and reinforced in the New Testament. As with the church and the nations, God is moving His chosen people - Israel, into place for the future completion of His program and their involvement after the rapture in direct fulfilment of prophecy. He has already brought them back to their ancient land and given them Jerusalem in 1967. However the current situation in Israel is one of constant turmoil and crisis. This is preparation by God for Israel’s signing of the covenant with the Antichrist that will kick off the seven-year tribulation. What lies ahead prophetically for Israel…? The intense suffering and persecution of the Jews throughout the world lead to pressure for a national home in then called Palestine (after the enemies of Israel the Philistines). 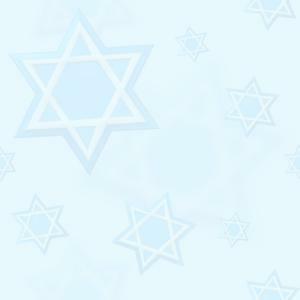 The Jews returned and re-established in Israel, the name God has for the land Israel, in 1948. The infant nation survives against all odds. Russia emerges as an important enemy of Israel but the United States of America comes to the aid of Israel. Israel’s heroic survival and growing strength make it an established nation recognized by UN and the world. Israel’s military accomplishments become overshadowed by the Arabs ability to wage a diplomatic war by controlling much of the world’s oil. The Arab position is strengthened by their growing wealth and alliances with Europe. The increasing isolation of America and its weak leadership with Barak Hussein Obama make it more difficult for Israel to negotiate an acceptable “peace agreement.” After a long struggle, Israel will be forced to accept a compromise with the new leader (Antichrist) of ten nations. Sometime in the very near future the Jewish people will celebrate what appears to be a lasting and final peace settlement. During the three-and-half years of peace, Judaism is revived and traditional sacrifices are re-instated in the rebuilt Third Temple in Jerusalem. The Arab armies together with Russia and Turkey will attempt to invade Israel but is mysteriously destroyed on the mountains of Israel. The newly proclaimed world dictator desecrates the temple in Jerusalem and begins a period of intense persecution of Jews. Many Jews will recognize the unfolding of prophetic events and declare their faith in Yeshua HaMashiach – Jesus Christ as the Messiah of Israel! In the massacre of Jews and Christians who resist this Antichrist world dictator, some witnesses are divinely preserved to carry the message throughout the world. Christ returns to the earth and is welcomed by Jews are their Messiah and deliverer. Christ’s thousand year reign on earth from the throne of David finally fulfils the prophetic promises to the nation of Israel! Many of these signs listed have been already fulfilled and some are current in progress, signs that God’s “End Time” program is on the verge of springing into full gear! It is exciting that all three streams of prophecy (Israel, nations and church) are converging for the first time in history constitutes a sign in and of itself. This is why we believe that we are now on the edge of history! If you want to know where you are in history …just keep your eyes upon what God is doing in Israel! Major things are taking place in our world today. Can you see what is going on…? ISIS and these extremist Muslims are being allowed to spread their destruction and fear around the world. It is all about Jerusalem… and there is blood in the air! War seems inevitable, and it is not about Saudi Arabia and Iran, but Israel. The enemies of Israel know that Barak Hussein Obama has just one year left until the United States has a President which will try to bring about the old alliances of the Middle East where Israel will have a stronger standing. The next 12 months that is left of Obama’s presidency will be the worst that America and the world has seen as he also knows that his time is short to fulfil his ideology agenda. Christians were being killed for their faith in the first century, as well as during the dark ages when the Roman Catholic Church ruled the world and killed tens of millions of God's people. This is being repeated today by radical Muslim Islamists in the name of evil called ISIS, Boko Haram and other Islamist groups in Syria, Nigeria and places like Iraq, Iran, China, North Korea, Pakistan, India, and Egypt, where many Christians are being killed for their faith in Yeshua HaMashiach - Christ Jesus everyday. And the Bible tells us in Revelation 20:4 that once the “mark of the beast” is enforced soon then this persecution will spread to the Western World. The Iranian/Saudi Arabian conflict is serious, and may lead to a conflagration (meaning: an extensive fire that destroys a great deal of land or property, holocaust) …however, the great enemy is and will always be Israel. It will not take long for the Arabs, Turks and Persians (Iran) to turn their hatred toward Israel and the Jewish people. Because that is one thing that they do agree upon! Putin’s move into the Middle East was not just about propping up Assad, a man Putin has shown disdain for, in Syria. Neither is his alliance with Iran the result of his love for that regime. He has brilliantly positioned Russia to use both of them in a bold move to threaten Saudi Arabia and the other oil producers in the region. This will drive up oil prices, thereby saving the Russian economy. This is bold and brilliant, and a decisive man such as Putin will likely carry it out. The recent shooting down of a Russian plane in 2015 by Turkey gave him more cards to play. Cutting off Russian tourism to Turkey can devastate that country's economy. It also has the potential to create major turmoil in NATO, ultimately securing the Russian southern flank by bringing a capitulating Turkey under Russian control. Putin is smart enough to play the cards he's dealt, and it's not likely the Russian/Turkish crisis will go away until Putin has gained a great deal. Another factor is that almost all NATO countries are dependent on Middle Eastern oil. If Putin is ambitious (and he seems to be), he could break up NATO and bring many of the nations under Russian influence. This would force the E.U. to stand down and not interfere in his actions against Ukraine or other former Soviet states while freeing him for future endeavours. With all of that said, Sudan has claimed allegiance with Saudi Arabia, but we do not think that is for long. In the end Sudan will become an ally of Iran, as well as Turkey will, when the Gog/Magog War commences (Ezekiel 38). There is a lot of diplomatic manoeuvring right now. The Middle East is about to turn into a land of blood more than ever before. We are constantly following the events in the Middle East, and it seems there will be more articles as the world is on the verge of a terrible third world war. We also need to keep an eye on China as its economic engine is collapsing before our very eyes. China holds key to North Korea who is also testing nuclear bombs and could if they should wish to do so shut down their economy – but don’t even imagine this to happen. If and when China collapses, it will take Europe, and then the rest of the world with it. Economic collapse creates war, and it also creates the perfect situation where the “mark of the beast” can be instituted. We will continue to look at the situation in Israel and the Middle East as well as China. In time, all things will collapse, but we don't have to. God is always there for us His children! Together, Russia and China are systematically and effectively seizing the initiative in the world economy, due to the weak US President Obama and by that - world affairs! No other leadership in sight to counter this. It is the extraordinary geopolitical shift that is taking place now! Its implications are as far reaching as the fall of the Iron Curtain, but this time to the advantage of the former communist states. “And the nations were full of wrath, and Your wrath came, and the time of the judging of the dead, and to give the reward to Your servants the prophets, and to the saints, and to the ones fearing Your Name, to the small and to the great …and to destroy those destroying the earth,” Revelation 11:18. Are the nations angry today…? Yes! We have Arab uprisings, conflicts and wars all over the earth, Muslims Islamists posing as refugees infiltrating Europe to conquer and force the West to “worship” their pagan god of the Quran, Allah, through violence and destruction. Throughout history, the most dangerous weapon that man had was a bow and arrow. Today, with primitive weapons man could not do much damage to the earth. But, now just look at what man can do and is doing to the earth through industry and most importantly can do with destructive weapons of war such as a nuclear bomb! “So you, likewise, when you see all these things, shall know that it is near, at the doors. Truly I say to you, this generation shall not pass until all these things are fulfilled, Matthew 24:33-34.